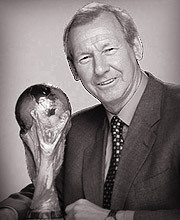 Born in Chesterfield, Bob Wilson found success playing in goal at school and gained England schoolboy honours in 1957. After qualifying as a physical education teacher at Loughborough College, he signed for Arsenal in 1963. He made more than 300 first-team appearances, helping the Gunners win the European Fairs cup in 1970 and one year later the coveted League Championship and FA Cup ‘double’. He also became the first English-born player to be capped for Scotland. In 1974 he embarked on a second career in sports journalism for BBC Television. He presented Football Focus for twenty years and was also a regular presenter of Grandstand, Sportsnight, and Breakfast Sport. In August 1994 he was lured to the rival channel as ITV’s football presenter.